The Herne Bay house was designed for a young family on an suburban north facing slope with northern aspect looking out over Herne Bay towards the inner Waitamata harbor in Auckland, New Zealand. The site is zoned by local planning authorities as Residential 2 which recognises the significant heritage and character of the area – predominantly of late 19th century archetypal Victorian Villas and Cottages. Architectural development in this area is mostly of alterations and ad-on’s to the existing Villas. An empty site requiring a new construction presented a rare opportunity – and equally demanded the contemporary re-conception of the archetype which typifies the surrounds. The Villa exemplifies Victorian ideals “imported” to New Zealand by its British settlers. Construction was adapted to utilise the locally abundant timbers which was a difficult step away from the otherwise familiar robust masonry constructions for the early builders. Regardless, the NZ Villa was always carefully yet robustly crafted, clad in weatherboards beneath hipped roofs. They are simple in form with a horizontally proportioned elevation including a sweeping verandah’s and well ornate entries. Victorian Villas face and present themselves to the street where the neighborhood can see them standing well mannered with good posture. Archetypal Villas are typically one level and assume a level landscape – in Auckland they are often raised on posts to fit a typical New Zealand sloping topography. Within, programme is compartmentalised by function, orthogonally arranged from a central linear axis. The rooms orientate inwards to this common hallway. New Zealand living ideals have long since shifted. We value common living spaces, access to the sun, and most significantly an outlook over our vast landscape with ample outdoor living space. Arguably the strict protection of the Victorian street front fails to recognise these ideals. The Herne Bay house integrates contemporary New Zealand ideals, contemporary design and construction whilst maintaining much of the language and posture of the well mannered Villa. The house is sculpturally formed over three levels from contemporary concrete slabs and panels. Garaging is excavated below ground and accessed via a ramp dipping below the house above. The upper most level, housing private bedrooms, is detailed to appear minimal in height and recessive beneath a finely hipped roof form. Seemingly raised above the NZ topography the mid level is boldly expressed with a robust horizontal composition of weatherboard impressed precast concrete fins. The fins abstract the traditional street verandah whilst aiding control of privacy and light into the spaces within. A contemporary adaption of street frontage has been achieved however without dictating the spaces within nor access to sunlight and the generous view. Programme which is orientated about an inward facing corridor as per a traditional Villa, is adapted and instead arranged about a central exterior core. The northern positioning of the core re-orientates the house from an off street access to allow sensitive access to light, outdoor living and a view of the Waitamata beyond. The core also acts as a linkage vertically between the three levels. 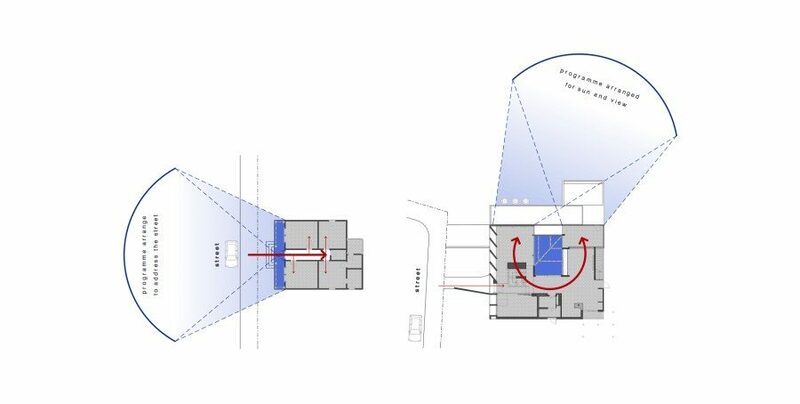 Adjustments in floor levels in response the site’s sloping topography aid a further departure from the traditionally linear axis. 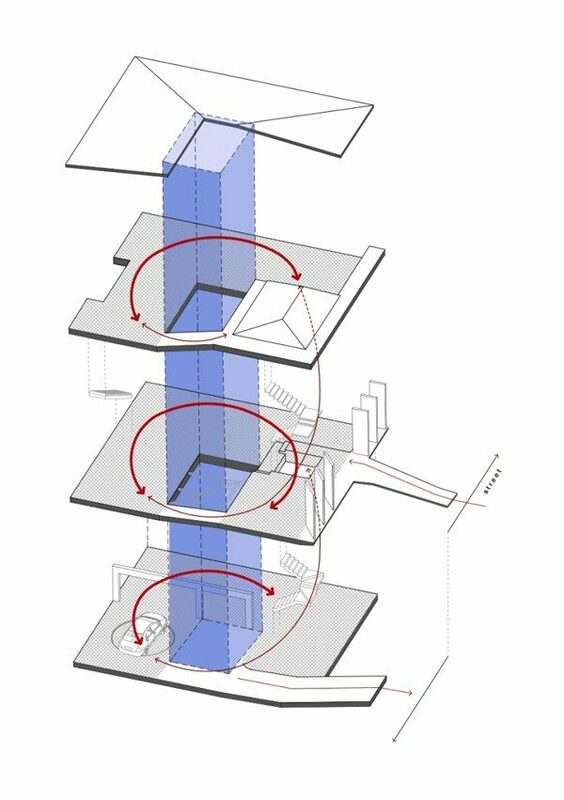 The programmatic wrapping of function about a core along with offset floor levels and ramping features form a spiraling axis. Whilst living spaces are open and linked to the exterior core – the strategic positioning of trombe walls, bespoke cabinetry items and fireplaces allow a variety of interior spaces. Living spaces are both grandeur yet intimate much like the street facing rooms of the traditional Villa.